Humidification Chambers - Preservatech Inc.
Our humidification chamber PHC is designed for paper conservation treatment. The chamber is offered in 1 standard size and works using our PMCG technology, without the use of liquid water. The humidity inside the device is generated through solid state filters built into the unit. The microprocessor controls the relative humidity and temperature of the inside compartment using PID control or Ramp-Soak schedules. An achievable microclimate inside the module can be controlled up to 60°C for temperature (heating only) and up to 80% for relative humidity. The chamber is built with powder coated aluminium and can be equipped with removable perforated shelves. Body: Powder coated aluminium, glass front doors, optionally stainless steel inside liner. LPHC are , an acrylic-aluminium made humidification chambers designed to work with our Mini One microclimate generator. LPHC is offered in two standard sizes and also can be built as a special order in different sizes by client request. The body is made of black acrylic with aluminium and front doors from clear acrylic. RH levels are controlled through the Mini One microclimate generator. We are also offering special order microclimate chambers build to client specifications. 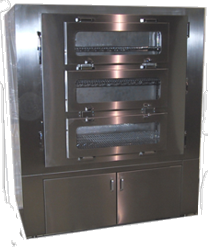 Those units are constructed from stainless steel and depend on client expectations. All aspects of microclimate can be controlled: relative humidity, temperature and low level of oxygen can be attained. Chambers with controlled relative humidity and temperature can be built with glass doors (as in photo). Units with modified oxygen have solid, special sealed doors. Low level oxygen is generated using nitrogen generator or liquid nitrogen. Please contact us if you would like to further discuss your needs.